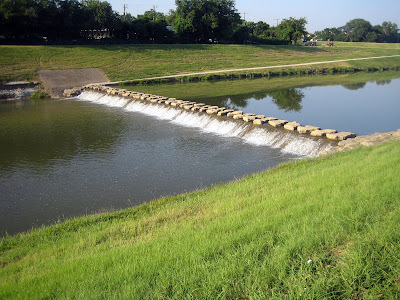 In one morning of selfish indulgence, I motored down to Fort Worth to tour some of the prime trails along the Trinity River. It was selfish indulgence for a variety of reasons, a few of which are listed below. 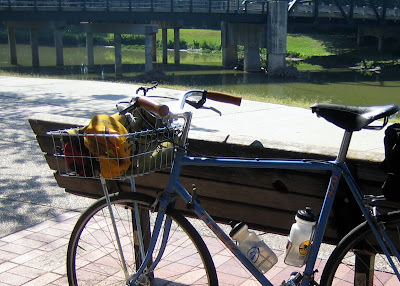 Since moving to Denton County, almost none of my rides involve packing the bike and driving to another start location for a bicycle ride. This has been an amazing privilege. The habit of starting from home has been so well-rehearsed that driving south an hour felt indulgent. 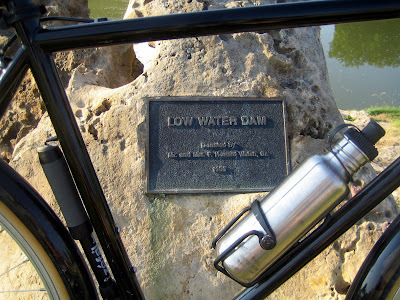 As privileged as I am to live and ride where I do, I occasionally long to ride in other locations and see things I am not able to see on a typical ride. 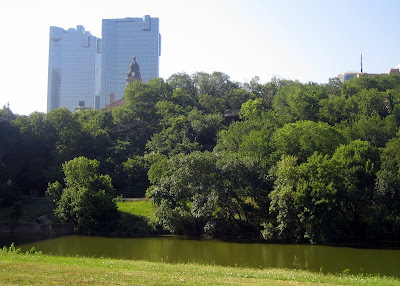 Knowing that Fort Worth has some nice trails along the river, and that I could overlap riding on these trails with rolling through an urban environment had a definite appeal. Me - "I'm coming to Fort Worth to ride in your neighborhood on Saturday, June 27." Me - "I'll need you to drop whatever you have planned to show me around for a couple of hours." Myles is just that kind of nice guy. However, just because I imposed on him, doesn't mean you should. 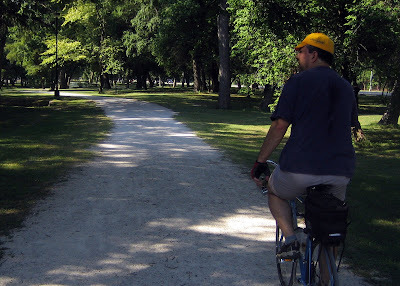 Instead of trying to find a place to park in a foreign land and riding around in places I have no business riding (while missing all the noteworthy areas), I had a knowledgable, local tour guide on two wheels. 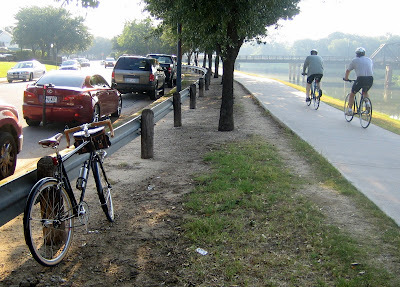 It doesn't get any better for the selfish indulgent bicycle tourist. 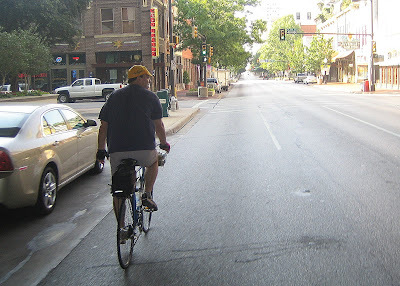 Myles knew all about how to find the quietest, low traffic urban roadways. He must have spent hours pouring over maps, preparing the perfect mix of roads and trails, centers of commerce, and peaceful park land. We toured older neighborhoods with houses designed and constructed with real personality and threaded our way through blocks of sky-scrapers. It all started here at the agreed meeting place. Then we headed into downtown. My tour guide was well-prepared. I didn't ask him, but I'm guessing he had a first aid kit in that rear bag in case I skinned my knee or felt a little woozy in the Texas summer heat. He pointed out various scenic and historic architecture, as well as local flora and fauna. He showed me the local feral cat colony. ...and being the consumate professional that he is, he let me ride it. He took a photo of me for the family at one of the "don't-miss" sites. I probably would have avoided the city streets, stayed exclusively on the trail, and never found this place by myself. Finally, just a couple of extra shots of an area near the starting point. 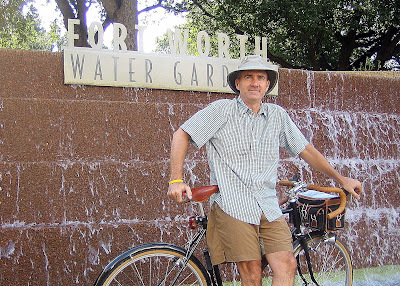 Thanks, Myles, for a most excellent bicycle tour of Fort Worth, Texas. Come up my way when you get a chance and I'll show you...uh...well...cows, I guess. I would have loved to join you guys, but I had some prior commitments this morning. Looks like you had a great ride. If you ever get back to Fort Worth, let Myles know; he knows how to find me. I had a great time. Paul (Doohickie), I'll be sure to contact you. Maybe next time we can get a few of the other local bloggers to ride along. It would have been great to have you along, Paul. If you guys think a group ride is in the works, I'd make a special trip down to participate. A vintage ride would be great, but my bikes are new. One lugged steel and one French inspired front loading geometry, but both new. I'm happy to drive down there to participate, but I'm not committing to buying another bike...yet. Looks like a great ride. 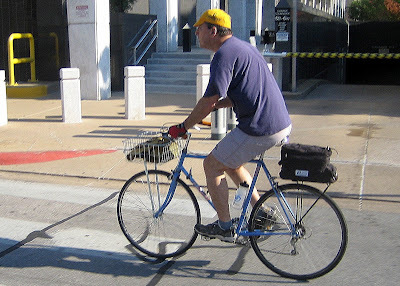 Don't feel guilty about driving to ride, or enlisting a local to show you around. It obviously worked out well, and one thing great about riding is exploring new areas. Sometimes it takes a little driving to get to a new area to explore. It's really cool that you got to ride with Miles. It's always interesting when two people whose blogs I read cross paths in real life.